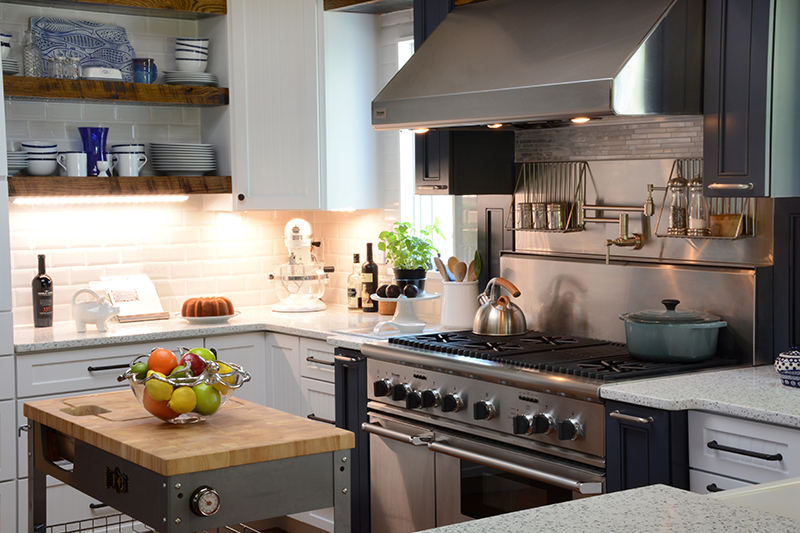 LEVIN PROFESSIONAL FARMHOUSE KITCHEN – Kitchen | The Glades, Rehoboth Beach, DEDan and Lauren, (chef/restauranteur, and baker), desired a professionally functioning kitchen with a farmhouse flair. 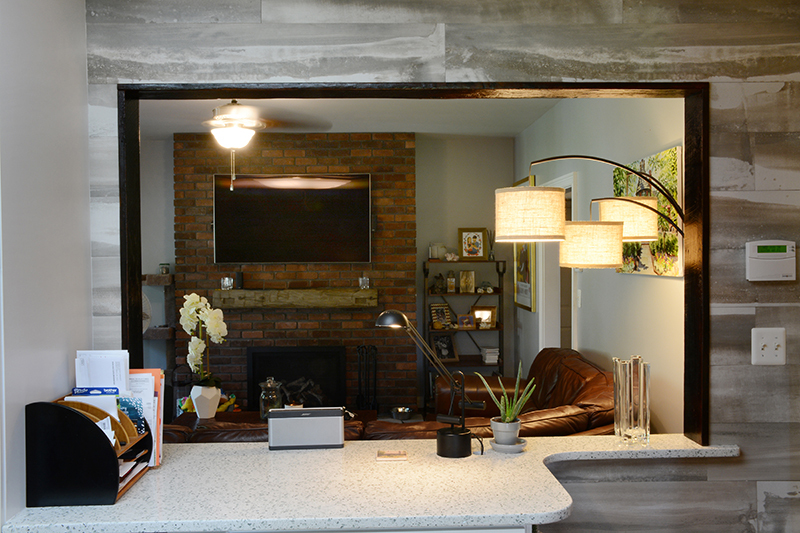 We specifically crafted this kitchen with its work zones, abundant storage and custom details to be a living, working expression of their souls. LEVIN PROFESSIONAL FARMHOUSE KITCHEN – Kitchen | The Glades, Rehoboth Beach, DEWhite and navy cabinets; reclaimed wood shelves, driftwood details, bold oiled bronze and stainless steel hardware, dark hardwood floors, beveled white subway tiles and concrete stained plank porcelain tiles, are all finishes we employed to function in an aesthetically stunning space. LEVIN PROFESSIONAL FARMHOUSE KITCHEN – Kitchen | The Glades, Rehoboth Beach, DEThe kitchen flows into the dining room. 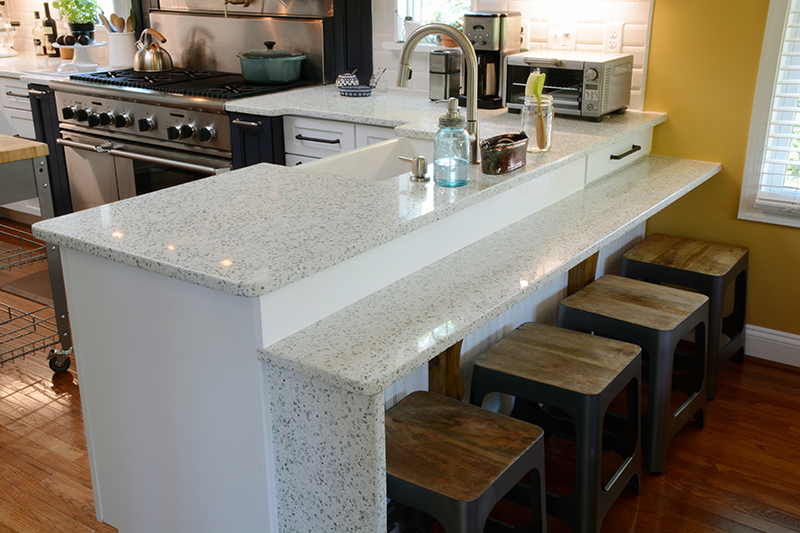 A clear, open unobstructed view is achieved by the child-friendly table height waterfall breakfast counter. Drawer, door and pull out trays in the corner cabinet for infrequently used items, means no space is wasted! 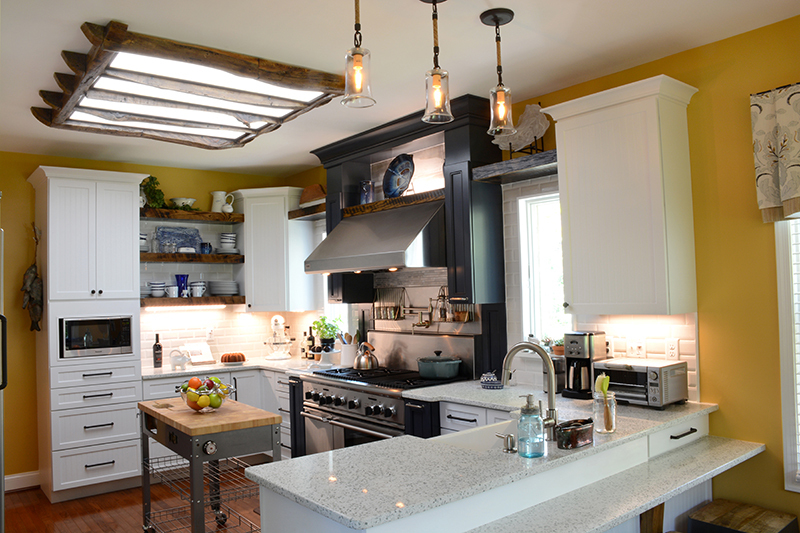 LEVIN PROFESSIONAL FARMHOUSE KITCHEN – Kitchen | The Glades, Rehoboth Beach, DEWe increased natural light distribution by replacing one large window with two smaller ones in new locations and added several new task and accent light points. 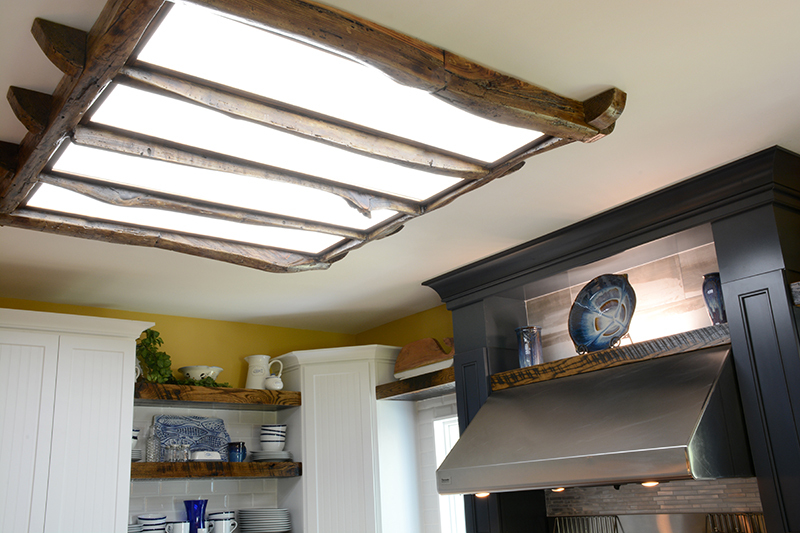 Our PETER E designed, fully dimmable four panel LED driftwood skylight was crafted to be functionally stunning! LEVIN PROFESSIONAL FARMHOUSE KITCHEN – Kitchen | The Glades, Rehoboth Beach, DEProfessional grade equipment, convenient pot-filler, superior hood, lights, heat lamps, warming trays, pull out spice racks, in arms-reach cooking utensils, trash, knife storage, built-in cutting boards and flexible preparation island – everything is purposefully appointed to work efficiently. LEVIN PROFESSIONAL FARMHOUSE KITCHEN – Kitchen | The Glades, Rehoboth Beach, DESome details can’t be duplicated! 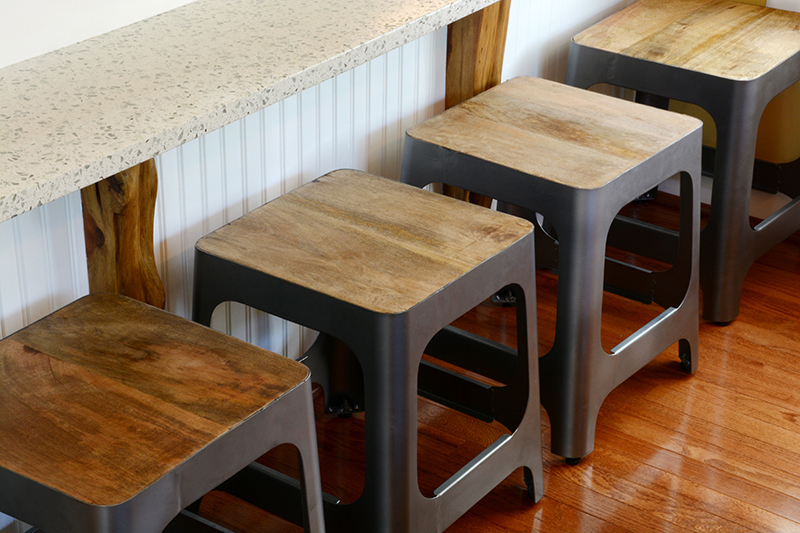 Here we partnered with nature, to create these time crafted post/brackets to effortlessly support the quartz breakfast counter. The result, a structural element, both elegant and timeless. 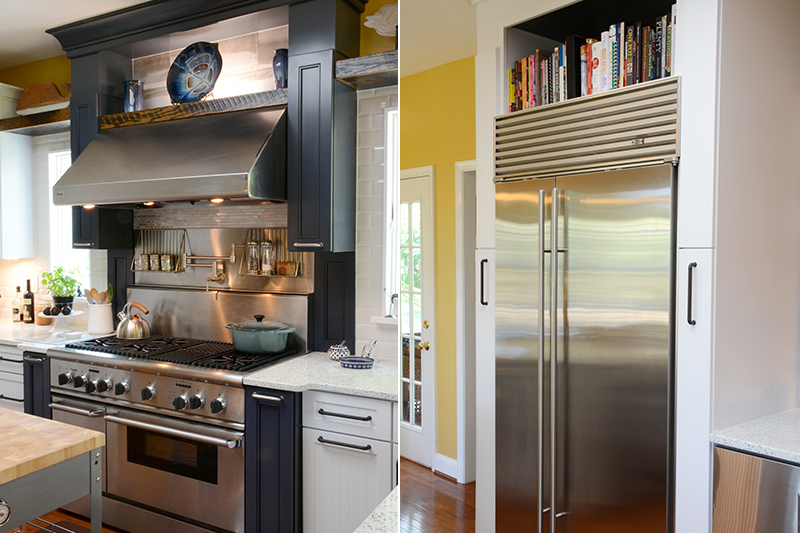 LEVIN PROFESSIONAL FARMHOUSE KITCHEN – Kitchen | The Glades, Rehoboth Beach, DEWe are function driven, client inspired! Purposeful items, from the octopus fruit dish to crockery, was selected to reflect the client’s love of the beach and beach town they live in. 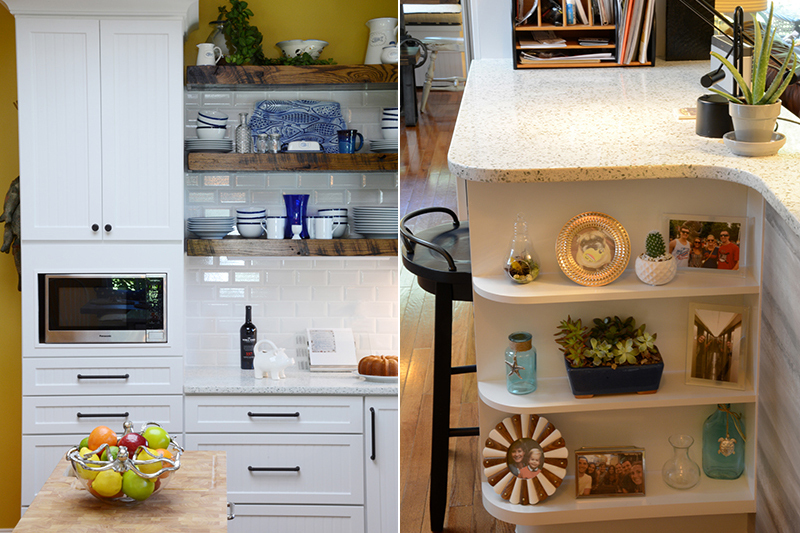 The shelves in the kitchen desk also provided areas to display my client’s passions. LEVIN PROFESSIONAL FARMHOUSE KITCHEN – Kitchen | The Glades, Rehoboth Beach, DEThis new opening with its 1”x 8” reclaimed wood frame set in a contrasting stained concrete porcelain plank tile wall, opens the kitchen to the living room’s entertainment, oversight, conversation and a more relaxed and informal home. Small change, simple detail – big results!